We were tipped off to Seventh Generation’s Science Man recently by @WorldCentric. & Environmental Technology, Martin Wolf, who has 30+ years in environmental product design, evaluation, and analysis (true to name, he also has a pretty fantastic Wolf man ‘stache & beard). He takes eco-related questions from the general public and answers them quite well (with full references). How much water and total energy does the average dishwasher use? Is using a dishwasher more sustainable than washing dishes by hand? “According to the U.S. Department of Energy, washing your dishes by hand uses more than twice the amount of energy and water it takes to run an EnergyStar dishwasher when washing full loads. 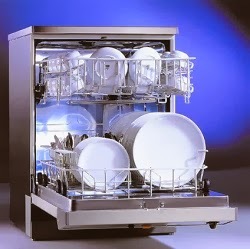 By using an energy efficient dishwasher instead of washing dishes by hand you’re saving money and time too! 4 gallons! Kitchen faucets flow at at bare minimum 1.5 gallons / minute (most are 2 – 3.5 gallons / minute). So, if you’re running your tap >3 minutes (which you almost certainly are are if you’re washing a full load of dishes), then the dishwasher is clearly the way to go. Keep your eyes peeled for more posts from us down the road highlighting other Science Man answers (e.g., “Are plastic shower curtains bad for the environment of your home?”).